I have been working this past week to finalize the photos for the upcoming book, Equine Tapestry: An Introduction to Colors and Patterns, and I thought it would fun to share a teaser image. The above picture shows how the dappling pattern – including the distinctive ‘spider vein’ pattern on the gaskin – on a champagne is a near-perfect reverse of the dappling pattern on a sooty palomino. I met this mare at a local Appaloosa show, and took numerous photos of her striking coloring. I have been very fortunate that so many people from around the world have been willing to share images of their horses. Looking through the draft of the book, it pleases me to see so many different breeds, and so many different countries, represented. Three years ago, when I began work on the previous book, one of my biggest worries was whether or not I would be able to get the photos I needed to tell the stories of those breeds. This time around, my biggest challenge is fitting in all the images I would like to use! Because there are still quite a few steps to go before the book is finalized, I do not yet have a publication date. If there is one thing that I learned from the last time, it is that there are always new ways for a book to be delayed! I will keep blog readers posted as things progress, though. I plan to post a few more teaser images as I get time in the upcoming weeks, including some additional photos of Vasco Piskui, the manchado Polo Pony from the cover. I was recently contacted by his current owner with some additional images of him that show more of this rare pattern. So keep checking back – or better yet, enter your address to the right (“Subscribe to blog via email”) and have the blog posts delivered to your inbox. We previously discovered a missense variant… but did not immediately recognize its functional role… With sequence and phenotype data of more than 200 horses, we now realized that this variant actually appears to have a subtle effect on pigmentation and consequently termed it W20. This variant is common and segregates in many horse breeds. That is an impressively broad range of breeds. Along with the Thoroughbred and warmblood breeds, there is a mountain and moorland pony (Welsh), a number of drafts including one of the older ones (Noriker), a colonial Spanish breed (Paso Peruano), and even the Marwari. Taking that into account, and then looking at the known examples of W20, it is tempting to wonder if this might in fact be the mutation most often responsible for the common “flashy white” type of sabino. Those are the sabinos with blazes, stockings and perhaps some white on the belly. It is also the type of pattern thought to amplify the white in other patterns, producing what is sometimes called “sabino boost”. When the Sabino1 test became available, there was some disappointment that most horses thought of as sabino tested negative. Unlike the Splashed White patterns, which have one common and widespread mutation (SW1), there has not yet been a widespread testable form of sabino patterning. Looking at the list of breeds above, it does seem that if W20 is not the “flashy white” sabino gene, it is at least one of them. If that is the case, garden variety sabinos like the Shire at the top of this post, or the Paint Horse above and Arabian below, might carry it. There are still a lot of questions about W20. The original paper describes horses with the mutation as having “extended white markings”. From photographs of the known individuals with the mutation, it appears that homozygous W20 horses are more likely to have belly spots, but perhaps not much more than that. That does fit with what is known about breeding programs that center around horses with flashy white markings, and the relative rarity of loudly marked individuals in those lines. It is also clear that W20 interacts with at least one other White-spotting pattern (W5) to produce an all-white horse. What is not known is what it does with other patterns, both other White-spotting variants and unrelated white patterns. If the mutation is present in the Clydesdale, for instance, then what makes white-born foals so rare there? Does it play a role in horses with more extensive patterning or roaning? What is the maximum (and minimum) expression for W20, both when heterozygous and when homozygous? These kinds of questions are important. For breeders, a better understanding of the way these patterns interact would make it easier to produce the “blaze and white socks” image that many find appealing, without getting excessive white on the body. Likewise a breeder of pintos might need to know how to ensure that enough white fell on the body to obtain regular papers. That is why I am encouraging anyone interested in pinto patterning to participate in the W20 Project. The project is to raise funds as well as collect samples for a more comprehensive study of the W20 mutation. To participate, owners pay $38 – a fee lower than most commercial tests – and submit 2 samples (30 hairs each) for each horse they want tested. Participants will also need to send three pictures (both sides and a head shot showing any markings) and a copy of the horse’s pedigree. Horses with white patterning as well as those without are wanted. Results will be available in June of this year. More information, including information on where to send samples, can be found by clicking the link below, which takes you to the W20 Project page. There is, however, only a brief window for getting involved as all funds and samples must be submitted by April 15, 2014. The problematic terminology, at least at the moment, centers around the sabinos and the dominant whites. It appears likely that most, if not all, future discoveries are going to be given consecutive numbers in the W-series. Because that is true, it is helpful to keep in mind that the W in the name means “white-spotting” and not “white”. Related to that, the tendency to refer to all the patterns in the series as “dominant white” is probably not helpful, because while KIT mutations are expected to be dominant (that seems to be consistent across a range of species), many are not dominantly white. In fact, some are not white at all. Like the older category of overo, the white-spotting category may not really tell breeders what they need to know about a color; it is not specific enough. From a practical standpoint, there are really three different categories that these white-spotted horses fall into. The first are the truly white – or at least nearly-white – horses. The horse above, White Prince, is an example of this type of pattern. In fact, his particular mutation (W2) is one that produces all-white horses consistently. 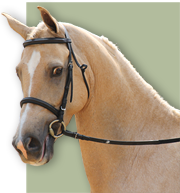 There are others that produce a bit of color (usually on the ears or topline, often in the form of dark ticks or spots), but the overall impression is still that the horse is pretty white. A good example of a family with this near-white expression is that of the Arabian, R Khasper (W3). The second category are the obvious pintos. These are the horses that are clearly broken-colored, with extensive white on the body. The average horseman, even one pretty familiar with color, would not call these horses white. Instead, they are most often called sabinos. The Thoroughbred family of Puchilingui (W5) and the Arabian families of Rhocky Rhoad (W15) and Fantasia Vu (W19) fall into this category. And finally there are the horses that would be thought of as having white markings. Not only are horses like this not obviously white, but many would not recognize this as a pinto pattern. The recently-discovered W20 mutation falls into this category. I say these are practical distinctions, rather than genetic distinctions, because most often breeders have a preference for one of these three phenotypes. Breeders of white horses, for instance, have struggled with the tendency their lines have for producing what they thought of as pintos. Meanwhile many breeders of pintos often want to avoid a horse like White Prince, which many colored horse registries view as “solid”. And patterns that produce flashy white markings, but that do not consistently produce white on the body, can be problematic in both solid and pinto breeds. That is why it is not necessarily helpful to categorize all the W mutations as “white”, nor for that matter to call anything that puts white on the horse “white patterning” – even if it is genetically accurate to do so. The challenge, however, if that while those really are the categories that interest breeders, the genes themselves do not all fit neatly into just one of them. The relationship between the three basic phenotypes can only be called complex. In fact, there are intermediate colors that make the borders between the categories pretty fuzzy. Patterns like this one, for instance, sit somewhere between the white (and near-white) horses and the sabino patterns. For most horsemen, this is still very much a pinto pattern even though from a visual standpoint it is quite different from the pattern Sato has. Some of the draft and pony breeds, either by informal tradition or by actual rules, penalize horses with white on the body, but this kind of pattern might fly under the radar as “roan”. (If you nudge the contrast down a bit, that is even more likely to be true, and many individuals have less contrast than this particular horse.) Paint Horse breeders, meanwhile, would not only consider this a pinto pattern, but they would think of it as a fairly loud and obvious one. There are different traditions (and incentives) that play into how these pattern varieties are perceived. Here again are the images that given an idea of the range that white-spotting (W) can take: white, sabino-roan, sabino, and white markings. As pointed out, it can be difficult to draw a hard line between these four categories because one tends to blend into the next. But what makes the situation difficult to simplify is that there are different combinations that can produce the same color. Horses that look the same can be the product of a different genetic “recipe”. She could be homozygous for Sabino1. In that case, she would produce 100% sabinos but no whites. Most would probably run towards the roany end of sabino expression. She could be heterozygous for a Dominant White variant that was inclined to be more truly white. She would then produce 50% white or near-white, and 50% solid. She could be a compound heterozygote for two white-spotting genes. She would be expected to produce one of those patterns 50% of the time, and the other 50% of the time, but no whites like herself. If the other white-spotting pattern was something like W20, half the offspring might have white markings, but might not be readily identifiable as pinto-patterned. She might have a combination of patterns unrelated to the KIT gene which, when combined, give an all-white foal. In this scenario, she might produce quite a range of patterns either singly or in combination. That means that without knowing what a white horse carries, you might have a horse that never produced its color, or sometimes did. Likewise it might never produce a truly solid horse, or it might sometimes do so. In the case of the fifth option, there could be entirely unexpected outcomes. It is not surprising then that white breeding programs established in Europe during the Baroque era typically ended in failure! Without a way to tell visually identical colors apart, the results would have seemed very unpredictable. For many, it probably still seems this way. The fact is that what is true for one particular white-spotting mutation might not be true for the others. Each mutation requires its own explanation. With twenty different named white-spotting mutations, and many many more believed to exist, it is not surprising that many find that prospect discouraging. Because this is an area of ongoing research, it seems the most pragmatic approach is to not expect a perfect system for categorizing and naming these colors – at least not yet, when the picture is still incomplete. In the next post, I want to focus on the effort to fund a study of the newest of the white-spotting mutations, W20. That study has the potential for expanding our understanding of these types of patterns, so I want to give it the attention it deserves.